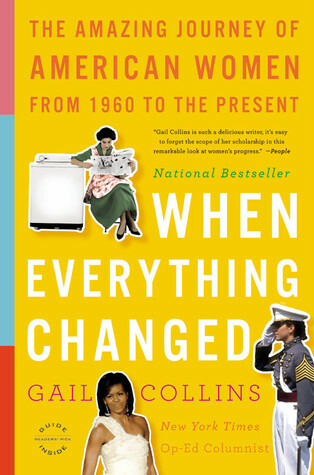 When Everything Changed is an incredibly comprehensive account of how the role of women in society has changed throughout recent American history. Though I expected this book to have a certain level of detail in its research, I did not expect it to discuss this topic from such a wide variety of perspectives. Here the heterosexual white woman must share center stage with lesbians and women of color as well, piecing together a historical view that is much more holistic in its approach. For instance, Collins emphasizes the struggles of Native American women who have been further discriminated against and marginalized due to their culture. History is never one-sided; consequently, Collins has clearly made an effort to reflect as many sides of the historical dice as possible. While reading, I found there to be both advantages and disadvantages to the way this book is organized. In general, the overarching structure of this book worked really well. It was divided into parts and chapters, with each chapter being further divided into different sections that each began and revolved around specific quotes. It was a subtle way to keep important themes alive throughout the entire text without directly stating them each time. However, at times the narrative felt a bit disjointed, mostly because Collins tended to go off on tangents about certain women or events. Though she always meandered back to the main topic eventually, these diversions made it more difficult to follow the chronological line that Collins initially seemed to be following. One of the last topics that Collins discusses in When Everything Changed is Hillary Clinton’s 2008 presidential campaign. Though she was not successful in gaining the seat in office, at the time her attempt was nevertheless hailed as a political success for women. Part of me couldn’t help but wonder what remarks Collins might make about Hillary’s most recent presidential campaign and the results of the presidential election in general. (Is this me secretly hoping for the publication of an updated edition? YES.) In light of these recent events, I think that Collins’ book and the questions asks are not only relevant but vital for our society to be thinking about when moving forward. Overall, there are so many reasons why I enjoyed reading When Everything Changed: it captivated me, educated me, and made me think. Whether you’re a history buff or simply looking to gain more knowledge about the role American women have played in society in recent decades, look no further than Collins’ comprehensive, entertaining, and thought-provoking account. Would I recommend it to a friend? : Yes! I think that this is an important topic for anyone and everyone to learn more about, regardless of gender. Have you read this book before? If so, what are your thoughts on it? Have any other recommendations for Gail Collins’ writing or books about this topic in general? Let me know in the comments section below! Great review! I actually never heard about this book but good thing I stumbled upon it in your blog. I do believe books like that are very important to 21st century generation, so everyone should at least give it a try. I am definitely going to!